Are you intending to update your old bathroom but can't get an accurate idea of how the new design will look? 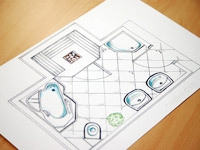 You need a bathroom space planner to turn your ideas into virtual reality and let you visualise it more clearly. With your plan in front of you, you can change anything from the colour of the tiles to the placement of your bath or shower. Online bathroom floorplanners are the best solution to the problem of designing your new bathroom, and ensure that you receive no unpleasant surprises later on! Many online bathroom planners are offered to their customers by the manufacturers of the bathroom units, sanitary ware and accessories to assist with their planning. Some of these free floorplanners can be used without registering at all, unless you want to save your plans; others require registration before much of anything can be done. Most of them enable you to save a copy of your plan as a PDF file in order to export it. Some work entirely online, while others are in the form of downloadable software that is installed on your own computer so that you can plan offline. This section includes planners for your master and guest bathrooms that work entirely online and enable you to produce two-dimensional, or 'flat', plans. These floorplanners produce three-dimensional bathroom plans and enable you to visualise your room much more easily in a realistic format. If you prefer to do your bathroom designing offline you can download one of these freeware software packages and install it on your PC for quick and easy designing. These bathroom planners will suit you if you would prefer to spend a little money in order to get the higher standards available from software that is designed for professional use. These programs have a much more attractive look to their final plans since they have higher graphics resolutions and therefore more detailed representations of the bathrooms and their contents. If you place a high value on the precision of the details and quick, easy operation these are the bathroom planners you will want to use. Do you know of another bathroom planner not listed here? We always want to hear about new bathroom planners that we haven't seen before, whether you've just found one online or if you are responsible for making it available! Please use our contact form to tell us all about it. Bathroom Planners5.00 out of 51 based on 2 voters.